You must explain your volleyball coaching philosophy early on. Help your players believe in your philosophy by explaining and giving examples of how and why it works. Hopefully this will develop their understanding of your program and how they fit into your scheme. Not only will this heighten their awareness of the game, but may also alleviate any guessing they may have of you. Just having a knowledge of what to expect from the coach will help create a better atmosphere among the players. The volleyball success pyramid helps explain the important steps a team must take to be successful. At the base of the pyramid are the athletes and coaches. This is where it's important to have all the coaches understanding one another. After you've been volleyball coaching for awhile, you'll start to see how important it is to have the right athletes. Many college coaches will tell you that 90% of their job is recruiting. If they recruit the right players, this makes coaching volleyball a whole lot easier. The next step is fundamentals. The team with the better fundamentals will likely overcome the other. The next step is system design. If teams are equal up to this point, the team with a superior system will prevail. The next step is conditioning. 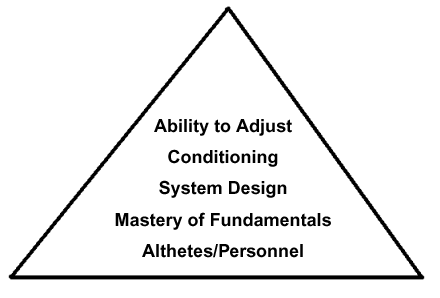 Conditioning includes being in both the right mental and physical shape. When equal in all other facets, the team that wins will be the one that can adjust to what's happening on the court. If your team is aware of these steps, it will help them understand your volleyball coaching strategies better and will help them climb the pyramid to success. Many players commonly play volleyball without realizing the various ways they can score. It's important for your players to understand the 4 ways to score. Most players understand how to score with service aces and kills, but forget about blocks and errors. Not only is it important to know that in order to be successful the team needs to score more points, but players must also know the various ways to score and create scoring opportunities. The percentages of each scoring method are different at each level. For example, at the high school level, 45% of all points are scored from opponent errors, 20% from the serve, 10% from blocks, and 20% from attacks. At the collegiate level, 32% of points are scored from attacks and opponent errors and 16% are from both serves and blocks. From this information, a coach may wish to develop a style of play and let players set goals from these standards. Players need to know how emotion and momentum are important to success in volleyball. All things considered, 50 to 75% of a game will be decided on emotion and momentum. If teams are evenly matched, the game is usually won by the team that goes on a run. Runs are fueled more by opponent errors than by kills and blocks. However, consistently serving tough, attacking, and blocking will promote an atmosphere for your opponent to make errors. If a team has momentum, emotion will help fuel the fire. It's important for players to understand they need to keep their emotional level strong and be mentally prepared for each play. Be sure to practice these emotional levels in practice to prepare for the real game.